Hypnobabies Home Birth with 1st Baby ~ 6cm to BABY in less than an hour! 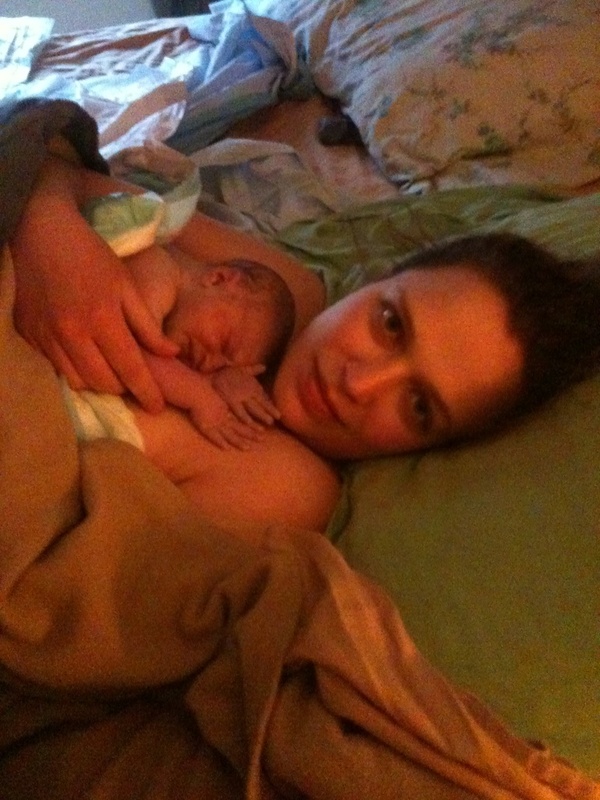 Thanks to Mary from the Hypnobabies Yahoo Group for sharing her birth story with us! 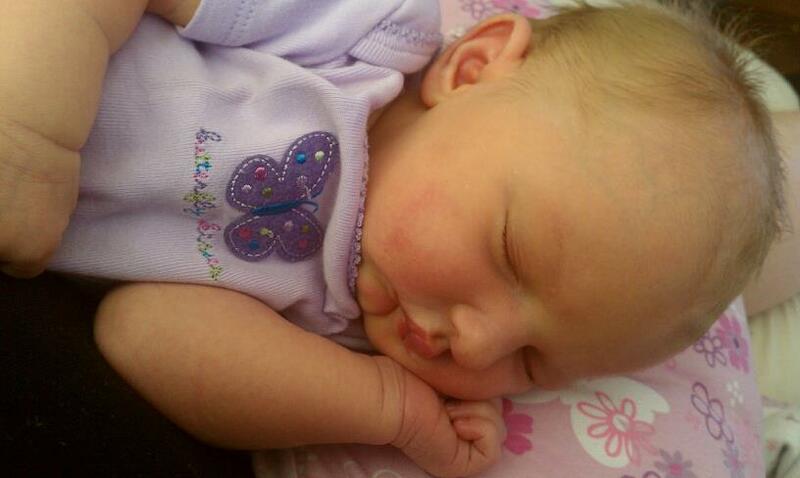 Elizabeth Marie was born into her fathers arms after a beautiful birth during an April blizzard. This was my first pregnancy and birth, but because of my background, I knew that I did not want to have a baby in the hospital. My husband was VERY reluctant to consider my desire to birth at home, but after extensive research, he decided it was the best choice for us. I didn’t have any cervical checks until my MW came over to asses my birthing time. On the afternoon of Wednesday April 6th, I started to have menstrual like cramping, I was in the NICU working on my bachelors project as I was graduating with my BS April 22nd. I didn’t think much of the cramping because all of my other experiences with Braxton Hicks felt like sharp tightening and from what I previously read on the Internet, what I was experiencing was not my birthing time. That evening, they became more noticeable. I was texting my MW, asking questions, and she decided to stop by after leaving her office to check up on me as it was hard to assess me via text. She arrived around 8:00 pm and checked me at about 8:30pm. I was 1.5 cm dilated, 85-90% effaced with an anterior cervix. She told me that if this was my birthing time, it was very very early in it. She said if everything continued, she could be born that night, but reminded me that things could still stop. I told her I would be happy with our baby being born 30-40 hours from now, and I wasn’t worried about it taking a long time. She suggested that we go to bed and sleep as much as possible. That was the best advice someone could have given me. The pressure waves (felt like menstrual cramps rather than tightening), continued through the night and I continued to listen to easy first stage and birthing day affirmations. April 7th, my pressure waves slowed and pretty much stopped between 8am and 10am (I think I only had 4 total in that 2 hours). They then picked up again and mimicked what had been happening previously. I think the PW’s were 4-8 minutes apart with the occasional PW that waited until 9 or 11 minutes to come. My husband and I spent the day shopping, picked up a new laptop, printer, and network storage. It was raining, and I had a few PW’s that I had to stop walking in the middle of the road until it was over while getting soaked. It made me smile thinking about how our little girl could be here soon. I was extremely comfortable, and continued to go to stores with my husband. At one point, I told him we really needed to get home. I didn’t want to inconvenience my super awesome midwife, so I did not tell her my contractions picked back up from that morning. I went to bed early (following yesterday’s advice), but I woke up and felt the need to get into the tub. I listened to Hypnobabies in the tub for about 20 minutes with pressure waves 4-7 minutes apart. I got out because the water did not seem to slow them down as it had previously, and I wanted to try to sleep again. 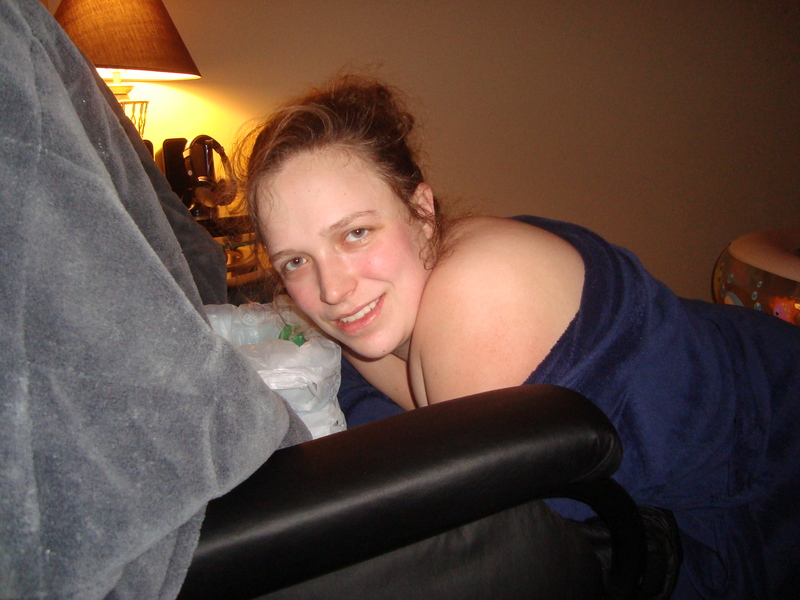 At about 2am, my husband woke me up, and we were intimate. At that point, it was like someone threw a light switch! PW’s became stronger and I had to start focusing on them more. I called my MW at about 2:30 am (April 8th), she did not think I was very far along as I was talking to her on the phone and sounded calm and happy. I put my husband on the phone, and she asked him questions about how uncomfortable I was etc and he said I was doing great and did only 4-7 minutes apart and I sounded too comfortable. At about 5:30, my PW’s were averaging closer to 4 minutes apart, so we called her back. I think I was a little frustrated as I knew that my little girl would be here soon. I made my husband call. She had us update her in an hour as I was still “too comfortable” and I told her during our prenatal visits that I didn’t want her here until I was unable to cope with my doula and husband. She asked me if I felt like I needed Benni (my doula), and I said no, but I would call her if she wanted me too. My doula lives an hour to an hour and fifteen minutes away depending on traffic and would have to drop her kids off to a babysitter on the way to my house so she asked that I give her a 1.5 hr heads up. My husband talked to my MW, and she said “I bet Mary wants me to check her,” he agreed. Again, he asked me if I was really in labor. I didn’t know if I wanted to smile, or hit him lol. At 6:23am, I broke down and told my husband that I was calling my MW because if she didn’t get here quickly, I was going to drive my self to the hospital. I said this to make a point, I did not want to go to the hospital, I just wanted my MW here and I didn’t feel as if they took me seriously. I called her and when she answered I said “Where are you! !” and her reply was “In your driveway.” I suddenly relaxed. She left her supplies in the car, and watched me labor until 6:45am when I layed down on the floor for her to check me. She said I was 6cm and 100% effaced with bulging membranes. I thought that was perfect. It was the magic number I had in my head. She quietly told my husband that it could either go really really fast, or really really slow at this point. She asked me if I wanted her to call my doula, I said yes. I wanted to make sure I was really in my birthing time before I called her because I did not want her to make an unnecessary trip to my house. I asked my MW if her assistant was coming, she said “Do you want her to?” and I said yes. She called her assistant who lived about 25 minutes away. My MW said I should change positions, so I moved from keeling over the seat of my rocker/glider chair to laying on the floor on my side. One contraction, I started to squirm, and she placed one hand on my hip, and the other on my shoulder and said “just stay put.” I later learned that I was at the point in which I just had to let my body take over and not run away scared. I felt the urge to pee, so I went upstairs to the toilet. I couldn’t go because I felt that the seat was too low to the ground. I had a PW on the toilet and it was not enjoyable. I moved to my bedroom and leaned over my bed for a PW, and again felt as if I needed to pee. I went to the master bathroom, but was unable to go for the same reason. I then asked my husband for a towel to go on instead. My MW had him fetch a chuck, and I was finally able to go (it was literally just a dribble). I climbed into my bed, and layed on my side with a pillow between my knees. All of a sudden, my top leg jerked forward. I thought that was weird, but didn’t think anything of it. During my next PW, my midwife said “Are we going down to the birthing pool or are we having this baby on your bed?” I was so confused at this point, I learned that the weird sensation I was experiencing that caused my leg to jerk with the first one was actually my body pushing. I never felt pushy at all. I told her that I really wanted to be in the water, but I wasn’t about to move. My MW and husband quickly covered my bed with surgical drapes and such to protect it. MY MW quickly called her assistant who was in-route, and said I was pushing and her equipment was still in the car. Her assistant said she would bring everything in with her when she arrived. My MW said “During one of your next PW’s I need you to roll to the other side of the bed.” The side I was on was not protected. I rolled across my king size bed like a pro! Within minutes, my daughters head emerged, my midwife peeled the amniotic sac off her face (my water never broke and my MW did not want to break it), then my husband reached down to catch our baby. My MW told me to push, which caught me off guard as I never had to consciously push up to that point. I smiled, gave a push, and my husband caught our first born! It was a beautiful experience. 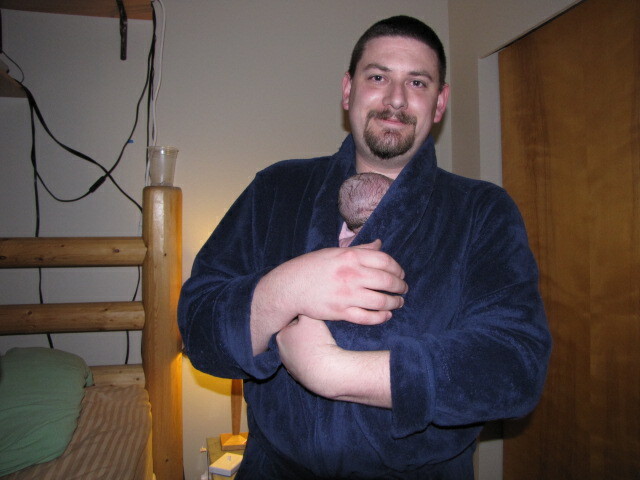 I held her for a few minutes and then asked my hubby to hold her skin to skin (she was still attached to the placenta). He took off his shirt and threw on his bath robe and held her. It was amazing. This was an experience I would have never had if we were in the hospital. He gave her back to me, and after the cord stopped pulsing, my husband cut it. My doula arrived a few minutes later. Although she didn’t have a name for a few days, Elizabeth was born at 7:42am, less than an hour after my cervical check at 6 cm. My body pushed for me, she was out in 11 minutes. I would have never been able to get through all of the early birthing time without Hypnobabies, and I attribute my succes during my late birthing time to Hypnobabies because it taught me to relax and trust my body.